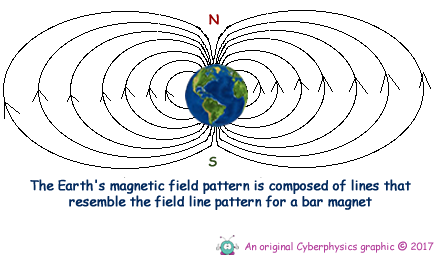 The Earth's field lines are similar to those of a simple bar magnet. The Earth's magnetic north is not at the 'true' north. 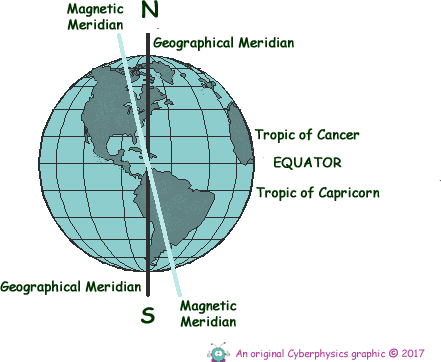 The Earth rotates around an imaginary line that joins the 'true north' and 'true south' poles that we call the Earth's Axis or the 'Geographical Meridian'. The line joining the magnetic north and magnetic south is inclined at an angle to the true axis line. This makes precise navigation by the magnetic compass a complicated matter. 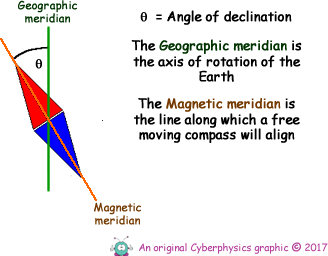 The axis line for the geographical true north/south is called the geographical meridian and the axis line joining the magnetic north/south is called the magnetic meridian. The angle between them is called the magnetic declination. Magnetic declination varies both from place to place and with the passage of time. As a traveller cruises the east coast of the United States, for example, the declination varies from 16o west in Maine, to 6o in Florida, to 0o in Louisiana, to 4o east (in Texas). The declination at London, UK is 1o 7' west (2014), and as the country is quite small that figure is fairly good for the whole of the country. Magnetic declination is reducing, and it is predicted that in about 2050 it will be zero. The magnetic field of the Earth is not fixed. Rocks formed from the molten state contain indicators of the magnetic field at the time of their solidification. The study of such "magnetic fossils" indicates that the Earth's magnetic field reverses itself every million years or so (the north and south magnetic poles switch). Why this should happen is a source of debate for scientists. If a piece of magnetised iron is suspended freely (hung from a fine thread or 'floated' on a pivot) it aligns itself with the field lines from the Earth's core. This played an important role in the development of mankind's navigation skills. The stars could be used to navigate by at night providing they were not hidden by clouds. Magnetic compasses 'worked' regardless of the weather and therefore played an important part in our exploration of planet. The 'north' poles on these little compasses sought out the magnetic north whether or not there was cloud cover. They were called 'north poles'. We know that the north pole of a magnet seeks out the south of another so if we were to make a model of the Earth with a magnet inserted inside it to simulate the magnetic field we would have to position its south pole at the 'north' of the model! Magnetic fields exert forces on moving electrical charges. So, the Earth's magnetic field can trap charged particles moving in the atmosphere, making them spiral back and forth along the field lines. The solar wind is a stream charged particles that are emitted from our Sun. The Earth's magnetic field shields us from much of the solar wind as it deflects many of the particles out into space and traps some of them in the upper atmosphere. It was discovered in the late 1950s that the Earth is surrounded by two regions of particularly high concentration of charged particles called the Van Allen radiation belts. It is believed that most of these particles come from our Sun. These charged particles trapped in the Earth's magnetic field are responsible for the aurora (Northern and Southern Lights) seen in the sky around the poles. To read news reports about the Earth's changing magnetic field click here.